Do you love reading police procedural, crime thriller or mystery genre? We do. Here are some of the hand-picked books in the genre we’ve reviewed recently. Accept it or not, there is an inquisitor inside of all of us. That leads us to seek the knowledge. And, it also leads us to know the things we are often not informed about it. So, if someone tries to hide something from us, we will go ahead to take some usual (and so unusual too) steps seeking the same. Gossiping is one of the best example of this hidden inquisitor in us. When growing up, we all have heard or read some of the detective fictions or spy thriller and kids adventure in the same arena. So, after we are grown up, the interest remains intact in this genre. Actually, everyone of us has an inner world and we want to prove ourselves hero there. 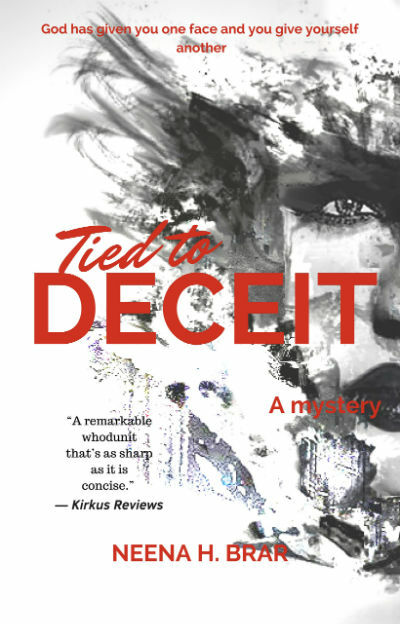 Recently, we came across a book named Tied To Deceit by debutante author Neena H. Brar. The book is provided by the author herself. Fortunately I got a chance to read this book from our team. I found the book interesting and worthy to share my views about the same with you all. Let us take a look at the cover page of Tied To Deceit. The cover page is intriguing. A woman’s eye looking straight to the reader from the snow clad land through black and white illustration, caches attention with the title of the book written in blood red color. The cover page is not a masterpiece but does its job effectively. Now let us take a bird’s eye view of the plot. While I will try to avoid as many spoilers as possible, but some of them can be inevitable. So please read with that consent. Dr. Rajinder Bhardwaj, a wealthy heir of a respected family lives in his 200 years old home with his wife Gayatri Bhardwaj. Neither the home is a mysterious place nor the town. He kept renovating the house over the period of time like his father, and is a charming place to live in. Rajinder runs a hospital in the city and he is genius in his field. Being a charming and respected person, flirting comes easy to him. And, he loves to do it too! He and Gayatri are not blessed with any kids and it became a reason for internal space between them. They are living together and follow the daily routines, but the spark is missing. Of course, this cannot justify adulteries by Rajinder. Gayatri knew about this side of Rajinder but wanted to keep herself in dar about it. Rajinder had an elder brother who is no more. Actually he did love marriage and thus his father broke all relations with him and removed him from property inheritence also. His wife worked hard to raise their son and contrary to a typical scenario she got support from Rajinder as well. That kid, Rudra, is now grown into a man and he also became a doctor. Rajinder invited him to work with him in his hospital. Eventually, he is the one who is going to handle it and inherit all the family properties by being the heir. So, everything is all right? No, it is not. Gayatri and Rudra doesn’t get along well. And, Rajinder is having an affair with a young staff member Devika at his hospital. Eventually, someone tip Gayatri about a place and name where Rajinder will be meeting Devika. Gayatri catches them red-handed! From this point forward there comes many twists and turns, dramatic incidents, murder and other crimes! And this chain of events brings Vishwanath Sharma, the police officer into the picture. He is investigating this whole case. Will he be able to uncover the truth? And, what is the truth? Well, you need to read the book to know :). It is not an easy task to write a police procedural or a murder mystery. You need to take care of many things while developing the story. And, by the time the story end, all the dots should be connected pretty well. Nothing should look like a patch to the story or a try to cover up the things which are missed. Being a debutante author, it is even tougher. Neena, we can say that is good at the same. Usually, for such a story, the summarized view of the story should always be in your mind, so whenever you pen down things, they shouldn’t lose the main track. It is rare to see such stories setup in the medical world and the environment of a hospital. Bye the way, recently, we found an interesting thriller named Hush A Bye Baby! on Juggernaut, setup in a hospital, and we will write our reviews for the same in near future. The quality of a police procedural can also be determined from the way the character(s) of police officer are explored. See, unlike we see it in the movie, they are not the super-humans. They are fellows like us and they have their own strengths and weaknesses. They also need to struggle in their daily lives like us. And, they do have their families to take care and worry about. Also, smart criminals have the abilities to fool the investigation officers, at least once, and remain undetected. It is not a drawback in the character, but it is rather the realistic approach in exploring the character. Why I am mentioning this? Well, you can see the things explored in this book has taken care about such stuff at an extent. And, I consider it as a positive attribute of the book, where it tries to remain as authentic as possible. Like many honest and straightforward people, she had a brutal way of stating facts, a quality which had earned her an additional unwarranted reputation for callousness. As often happens with introverts who, despite having nothing against people, find the solitude of their home more comforting as opposed to the company of others, he was thought arrogant by many. Also, the way she try to add humor in a thrilling scene will remind you watching Arnold Schwarzenegger movie 🙂 . She found the file, pulled a chair near the reception, and asked Rawat to sit there, as if she expected him to run away with the file. The young, thought Sharma, have this ability to suffer much in the time of grief, unlike the old who have seen enough sorrow and know it shall not stay forever. The young hardly know grief is like a thunderstorm. It comes whispering softly at first, a distant hum, a halo of vehemence in the sky, and then there is a sudden, violent, and copious outpouring; that drenches everything that comes in its way. It darkens the sky and turns every inch of green terrain dusky grey. But they don’t realize its ferocity will become less with the lapse of time, and the sun will shine bright and warm, and wash the land golden, and no one would be able to tell there had been a storm. They scarcely understand this essential unfolding of grief isn’t meant to last forever, and eventually, it shall come to pass. They were never divorced and spent their lives cursing each other and their respective families for their imposed solitary life. As an investigator, he had learned not to jump to conclusions without collecting data first, weighing the facts and then thinking the matter through thoroughly. I feel afraid all the time, madam. But fear . . . it never gets a chance to get to me because I never have enough time to give it a chance. Cowards are the first ones to abandon courage when they’re faced with any horror that threatens to befall them. They never shy away from inflicting misery on others, but hardly ever prepare themselves for the time when they’re expected to pay for the consequences of their own doings. The man made a fine criminal and a finer coward, thought Sharma. The air in the car felt heavy with unspoken questions. Secret griefs are more cruel than public calamities. Devika, Saroj Rani Jaiswal,Dr. Anju Trivedi, Vishwanath Sharma, Nandini,Arjun Rawat and others in a fictional town named Sanover. And this book provides you the thrills you can expect from it. The quotes alongwith each chapter are interesting. The book has some adult content, which makes it a read for matured readers only. Also, there are parts which could have been written in better manner. But the bumps are few. A detailed glossary and introduction to character can make the book even better. Overall, a nice thriller which you will love reading. Just keep it away from the minors. Around 7.5 to 8 stars out of 10.